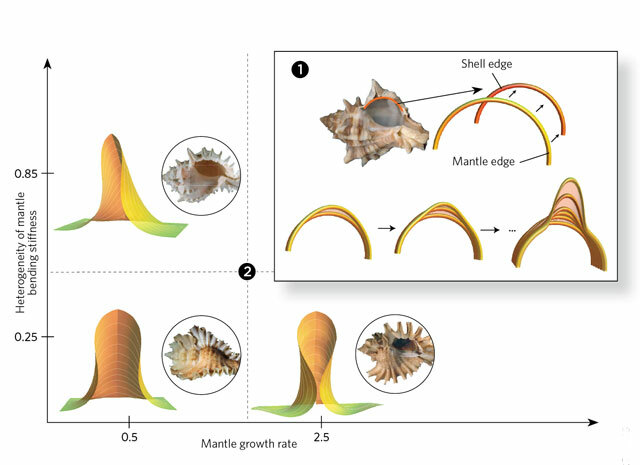 A mathematical model explains the physical mechanisms behind the formation of seashell spines, an insight that could shed light on the convergent evolution of the trait. R. Chirat et al., “Mechanical basis of morphogenesis and convergent evolution of spiny seashells,” PNAS, 110:6015-20, 2013. 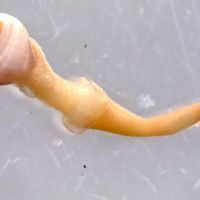 The spines adorning the shells of marine mollusks have evolved repeatedly across distantly related lineages, most likely because they help to fend off shell-crushing predators. But this functional explanation does not address the question of how spines form. In fact, the physical processes that shape spiny shell structures and that underlie their repeated emergence are not well understood. To tackle that question, Derek Moulton of the Mathematical Institute at the University of Oxford and colleagues developed a mathematical model to predict how natural physical processes produce a diverse range of seashell spines. 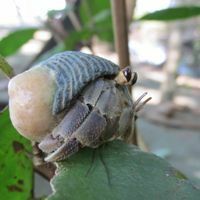 Mollusks build their shells incrementally with secretions from an organ called the mantle, an elastic cloak of soft tissue lining the inside of the existing shell. The mantle’s leading edge emerges just beyond the shell edge and secretes a thin layer of leathery tissue called periostracum. The periostracum attaches to the shell edge, where it forms a mold for the deposition of calcium carbonate—also secreted by the mantle—which crystallizes to form the next increment of shell. As the mantle grows and its leading edge gets longer than the shell edge, the resulting excess causes slight bucklings in the mantle itself and thus in the newly deposited shell edge. As the mantle gets longer, the bumps get larger, eventually forming the shallow grooves of a scallop, for example. 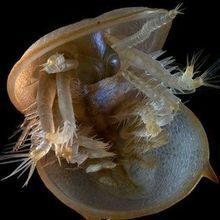 The researchers created a mathematical model to explain the formation of the more complex hollow spines and spikes of Murex snails and others, which protrude centimeters beyond the shell. Simply varying the growth rate of the mantle edge in the model changed the shape of short, folded spines but could not account for taller spines. But when the researchers incorporated variations in bending stiffness across the mantle’s leading edge, a more diverse range of shapes and sizes was produced. “By changing these two parameters [stiffness and growth rate], we could produce a fairly wide spectrum of spine morphology,” Moulton says. 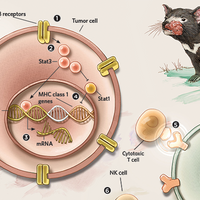 Little is known, however, about the genetic or molecular mechanisms controlling these conditions, he adds.